The cream cheese in these frozen strawberry pops makes them extra creamy! There’s still time to make these Frozen Strawberry Cheesecake Pops before summer’s up! There’s no cheesecake in these frozen strawberry pops, but there is cream cheese and whipping cream – making them the creamiest pops ever. Slice each of 3 strawberries into 4 slices, and place a piece into 12 8cl paper cups (or 6 25cl cups). Place the remaining strawberries in a food processor, with the cream cheese, and sugar. Blend until smooth. In a medium bowl, beat the whipping cream with a hand mixer on high speed until soft peaks form. Gently stir the cream into the strawberry mixture. Spoon into the prepared cups, then gently tap them on the counter to remove any air bubbles. Insert a wooden pop stick into the centre of each cup. Place in the freezer for 4 hours, or until firm. 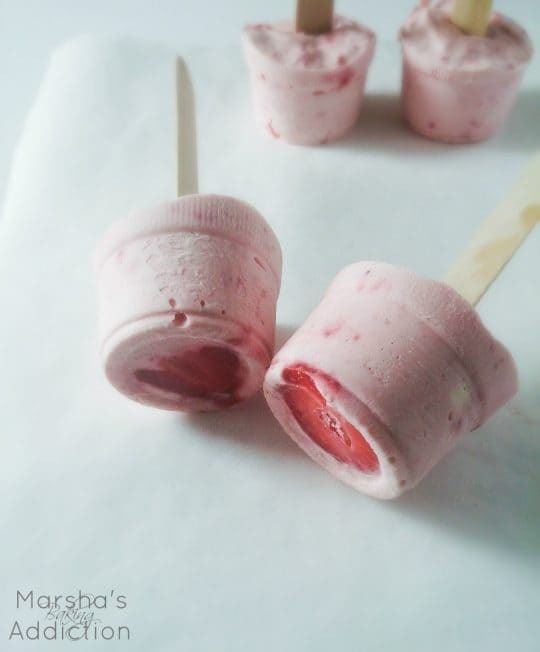 Remove the frozen pops from cups just before serving. Thanks, Leisel! Haha, you can make so much with whipping cream! Your recipes and your photography are both amazing! Can’t wait to see what you make next! Those cheesecake pops look delicious! Oh. Wow. These look amazing! I am making these TOMORROW!!! Thanks! I absolutely love strawberry cheese cake ice cream, so I KNOW I’m going to love this! This recipe looks so easy, I’m going to try it hopefully Labor Day weekend. Totally pinning! you don’t have to approve this comment, I just wanted to let you know the “rate this recipe” feature below the comments is super cool! this is the first time I came across one. Oh what a lovely recipe! I have to try this out as soon as I can! Mouthwatering 😛 Thank you for sharing and you have a lovely blog! Thank you very much Deniza! You too have a lovely blog! Love how few ingredients there are! Strawberry frozen desserts are always a hit at our house:) They sound like the perfect treat to cool down with on a hot day! Looks delicious and refreshing. I love the strawberry slice on the bottom. I’ve been looking at popsicle molds, but these are even easier! Ok WOW these look amazing. And I love that you could essentially do whatever fruit you wanted! Thanks! Strawberries are such a pretty fruit to make recipes with 🙂 I am looking forward to bake for autumn, though! LOVE these, Marsha! Strawberry anything is delicious but turned into a “cheesecake” frozen treat? Heck yeoka! I’ve never had cream cheese in a frozen pop before and I’m toe-ts digging it. Because yes to everything cream cheese! 🙂 can’t wait to try these! Pinned! These are awesome….my kids would totally love this treat. These look so good! My kids would love too! I just love simple and delicious recipes like this! Strawberries are just the BEST in summer! My God, my daughter is going to love these! And they looknso easy too. Hope they are, I’m awful with anything kitchen. WOW! That looks so cute and refreshing!